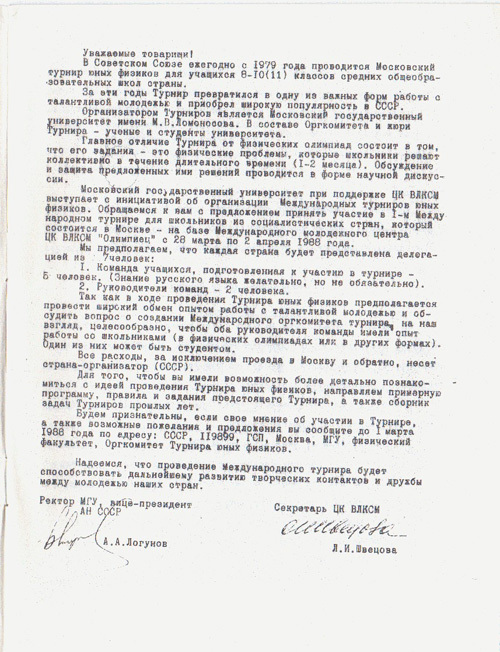 The formal invitation letter to the 1st IYPT (1988), published in a booklet sent to international participants, is translated from the Russian by Alexei Shekochikhin. The document announces the expected schedule of the event and provides rationale of why the International Young Physicists’ Tournament was to be launched. Since 1979, Moscow Young Physicists’ Tournament is annually held in the Soviet Union for the students from secondary schools of the country of grades 8-10 (11) . During these years, the Tournament turned into one of the important forms of work with gifted youth and gained wide popularity in the USSR. M. V. Lomonosov Moscow State University is the organizer of the Tournament. The Organizing Committee and the Jury are formed of scientists and students of the University. The main difference of the Tournament from the Physics Olympiads is in the fact that its tasks are the physical problems, which students are to solve collectively during a long time (1-2 months.) Discussion and defense of the proposed solutions have a format of scientific discussion. Moscow State University with the support of the Central Committee of All-Union Leninist Young Communist League (CK VLKSM) is taking an initiative to organize the International Young Physicists’ Tournaments. We address you with an offer to participate in the 1st International Tournament for the students from socialist countries, which is to take place in Moscow at the CK VLKSM’s Olympiets International Youth Center from March 28 to April 2, 1988. As it is expected during the Young Physicists’ Tournament to carry out an extensive exchange of experiences in work with talented youth and to discuss the question of establishing the Tournament’s International Organizing Committee, it is appropriate, in our opinion, for both team leaders to have an experience of work with students (in Physics Olympiads or in other forms.) One of them may be a university student. For you to have an opportunity to get acquainted in more detail with the idea of carrying a Young Physicists’ Tournament, we forward you the approximate schedule, regulations, and problems of the forthcoming Tournament, and the booklet with problems from the Tournaments of past years. 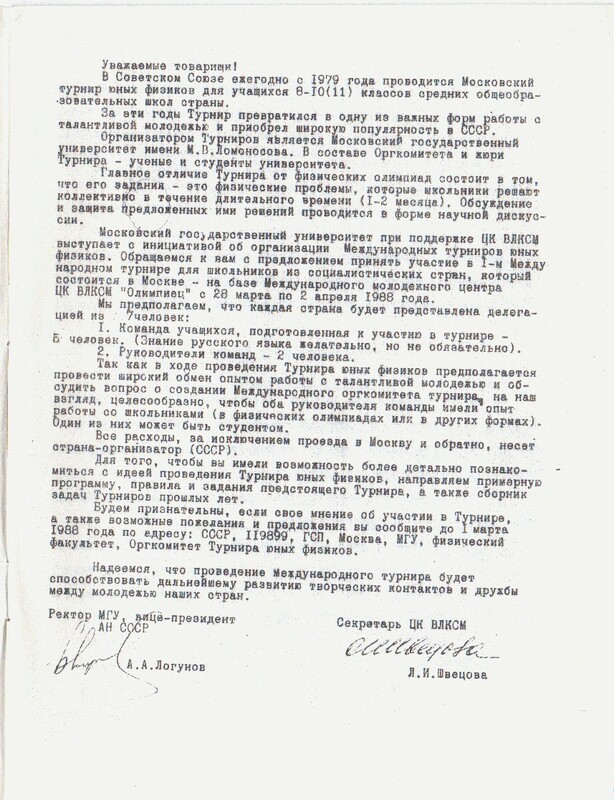 We will be grateful if you inform us about your opinion on participating in the Tournament, and also about possible wishes and suggestions, before March 1, 1988 at the address USSR, 119899, GSP, Moscow, MSU, Department of Physics, Young Physics Tournament Organizing Committee. We hope that holding the International Tournament will contribute to the further development of creative contacts and the friendship among the youth of our countries.